TURKSAT-3USAT is a three unit CubeSat built jointly by TURKSAT and the Istanbul Technical University (ITU). Members of AMSAT-TR (TAMSAT), the Turkish Amateur Satellite Technologies Organisation, have designed and implemented a V/U linear transponder for the satellite to provide amateur radio SSB/CW communications. The transponder input is 145.940-145.990 MHz and the output is 435.200-435.250 MHz, there will be a CW beacon on 437.225 MHz. TURKSAT-3USAT is expected to launch on April 26 at 0413 UT on a CZ-2D rocket from the Jiuquan Space Center into a 680 km Low Earth Orbit (LEO). The satellite has a de-orbiting system which will make it re-enter the atmosphere at the end of its operational life. 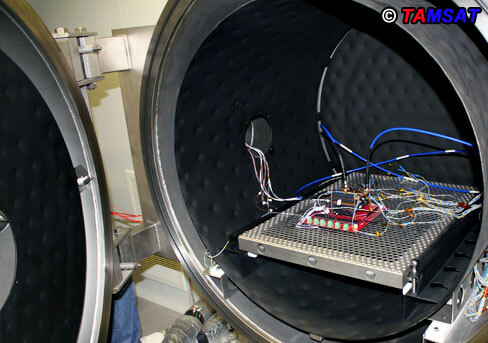 On February 9, 2013 TAMSAT President A. Tahir Dengiz, TA2T, and Vice-President Barış Dinc, TA7W, were at the laboratory in the Istanbul Technical University (ITU) where tests were carried out on the transponder.